The term morote dori refers to a traditional attack form whereby the uke grabs the nage’s wrists with 2 hands. Responses to a morote dori attack are practised in our school both from a static position under resistance and also in free flowing form. In the below video Takeda Satoshi Shihan (7th Dan AKI/Aiki Kai, Kamakura BudoKan) uses both static and free flowing forms of morote dori to explain the Aiki principle of “gathering an attack”. Sensei explains how to use this principle to take the uke off balance and then project the uke with a kokyu intent. focussing on the entirety of the uke rather than the point of contact. The video was recorded as part of special class given by Satoshi Sensei at our dojo on 25 November 2017. In the below video senior students from Aikido Warrior Dojo demonstrate one of the many versions of the Aikido technique katadori kokyu nage. This particular application of kokyu nage relies heavily on aiki sword principles, including cutting and footwork skills developed through solo bokken kata. In the below video, Christian Tissier Shihan (8th Dan Aikikai) demonstrates and provides instruction on the fundamental Aiki principles that underpin the subject technique. Its always disappointing to read and hear martial artists criticise how each other train and make comparative negative assessments on the worthiness of differing Aikido schools and martial systems. Martial art bigotry of this kind has never had a place in our dojo and never will. We have had the privilege on many occasions of having visitors train with us from different styles of Aikido and martial arts systems, including judo, tai chi chuan, taekwondo, jujitsu and traditional sword practitioners. In all instances the interaction has not only given us some insights into their respective martial art/sport, but equally importantly given us greater understanding of our own Aikido and training practices. In the below video, Dojo Senior Jeremy Gehrke, who is also boxing student, gives me the opportunity practice my Aiki parrying skills in response to committed boxing strikes. 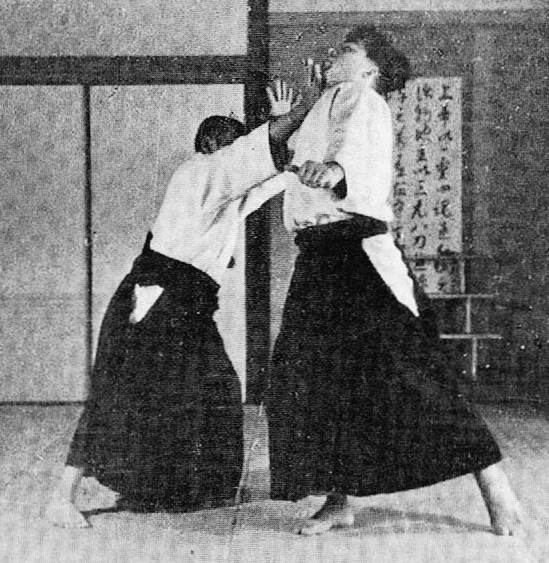 The technique that is ultimately applied (on the change of strike) is a form of breath throw – Jodan tsuki kokyu nage. I should add that the video should not be viewed as Aikido vs boxing. Nothing could be further from the truth. Jeremy is doing no more than giving me two forms of committed boxing strikes and allowing me to practice and develop responses to them using Aiki principles. In short, he is a training partner graciously assisting me to learn and not a competitor in any way. In the below video Dojo seniors (Ian Grant and Peter Marendy) practice jodan tsuki as it is typically trained in our dojo. A key aspect of our practice at the dojo is to use traditional sword movements to enhance and improve our unarmed arts. Our practice in this regard incorporates the use of a wide range of bokkens including the shoto (short sword), suburito and Musashi oar. 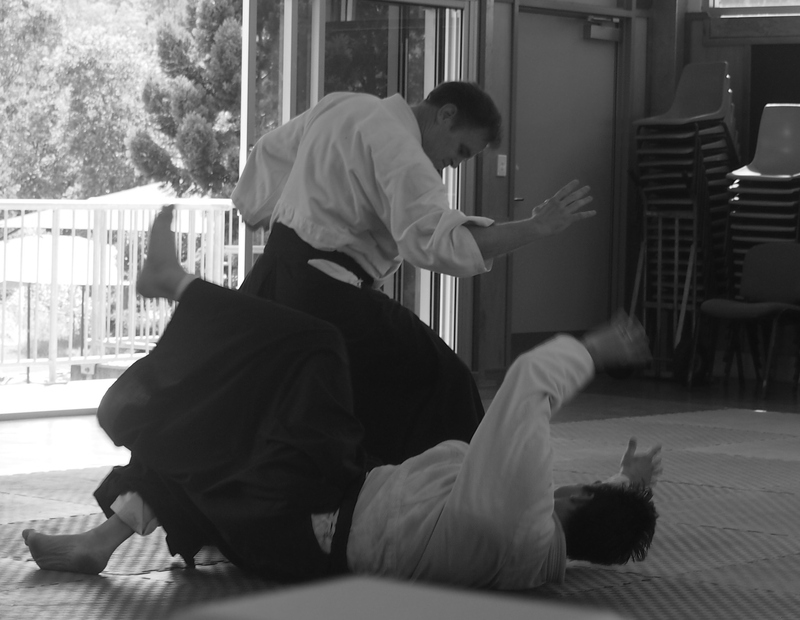 In the below video Ian Grant and Jeremy Gehrke Sensei use the short sword to explore the Aiki principles associated with absorbing and redirecting an an attack in the form of a shoulder grab (katadori). 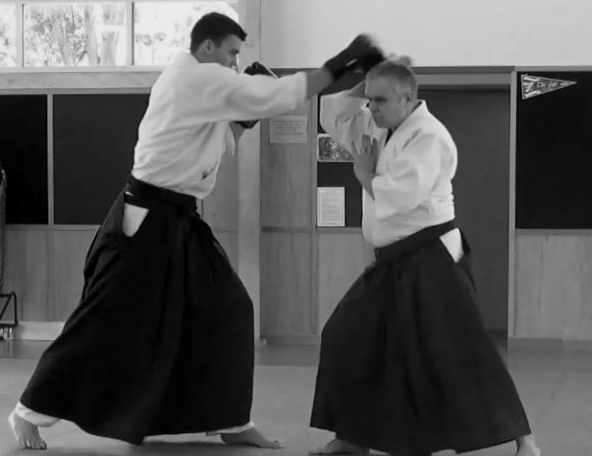 In the below video Chicko Xerri Sensei explores some of the key Aiki principles that underpin Aikido forms to address an attack from a shoulder grab. An integral part of the instruction in both videos is the use of the bokken to enhance understanding of the basic movements used in this type of practice. Our dojo is a Fudoshin dojo operating under the guidance and mentorship of Chicko Xerri Sensei, 6th dan AKI (Aikikai), Tokyo. Chicko Sensei has been practising and teaching Aikido for more than 40 years and is endorsed by Doshu Ueshiba. In the below video senior students from our dojo demonstrate a direct entry variation of the Aikido technique Yokomenuchi kokyu nage. In this particular variation, the nage initially executes a direct entry hand sword cut up the uke’s centreline to take their balance. This initial taking of the uke’s balance sets up the remainder of the technique and is critical to its successful application. In the below video, Aikido Warrior Dojo seniors demonstrate and explain key aspects of the Aikido technique Ryokatadori kokyu nage. 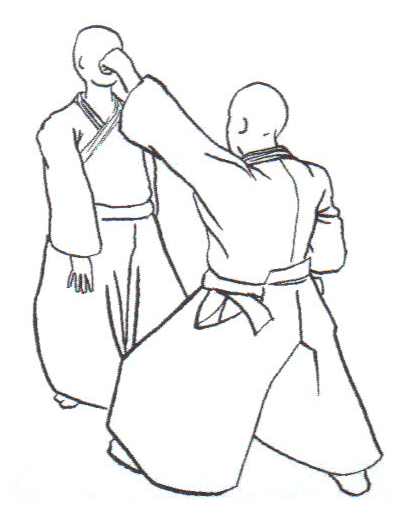 The technique is practised in response to an attack where the uke grabs both shoulders of the nage, most typically under movement. In this particular variation of the technique the uke is projected back in the direction of their original attack. 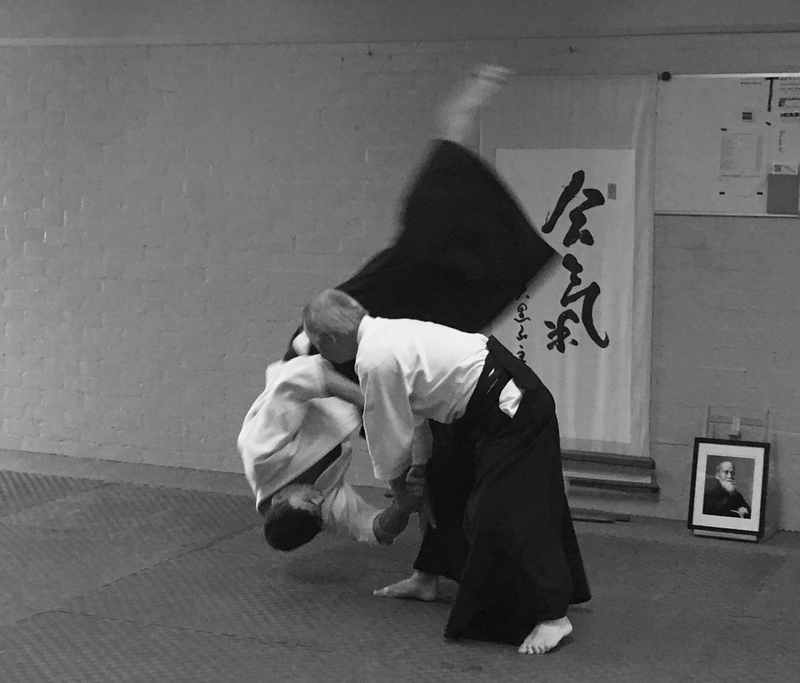 In the below video (also taken at our dojo), the nuances associated with receiving ukemi from the featured version of ryokatadori kokyu nage are explored. 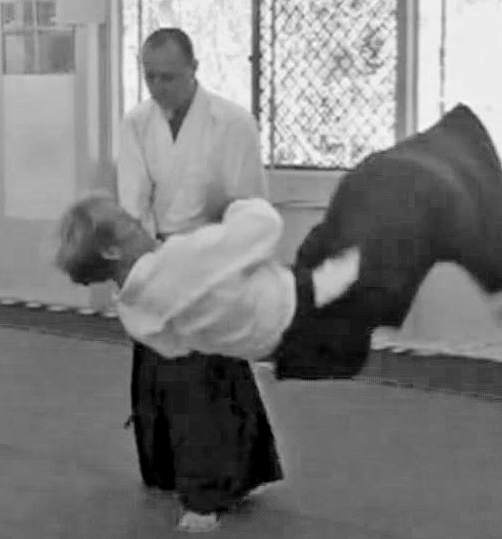 In the below video Morihiro Saito Sensei (1928-2002) provides instruction on the traditional version of ryokatadori kokyu nage as practised by O’Sensei (the Founder of Aikido) in the immediate post-war period of his life. In the below video produced by the TenShin Aikido Federation, a detailed examination of ryokatatadori kokyu nage is given with particular focus on the martial aspects of the technique. In 2003, Renshi Santos Shihan founded the TenShin Aikido Federation (TAF) in honor of O’Sensei and those who introduced TenShin Aikido into his life, including Steven Seagal Shihan. For some excellent videos on Tenshin Aikido check out their “Rogue Warrior” channel on You Tube. In the below video Aikido Warrior Dojo seniors demonstrate and explain key aspects of the Aikido technique bokken tori shomen giri shiho nage. The technique is demonstrated as a response to a downward strike to the head (shomenuchi) where the uke is armed with a wooden sword (bokken). In the below video, Peter Brady Shihan (7th Dan Aikikai) provides instruction on an alternate version of bokken tori shiho nage.